SAN MATEO, CA, August 17, 2018 — The award recognizes doctors who treat patients – not just conditions . with care and grace. In a recent Vitals Index survey, 1 out of 3 respondents said that a doctor who “listens and spends time” with them was the most important quality indicator. Research shows that the better the patient experience, the better the clinical outcome. That's because patients who trust their doctor are more likely to adhere to a physician's advice and take prescribed medications according to schedule. 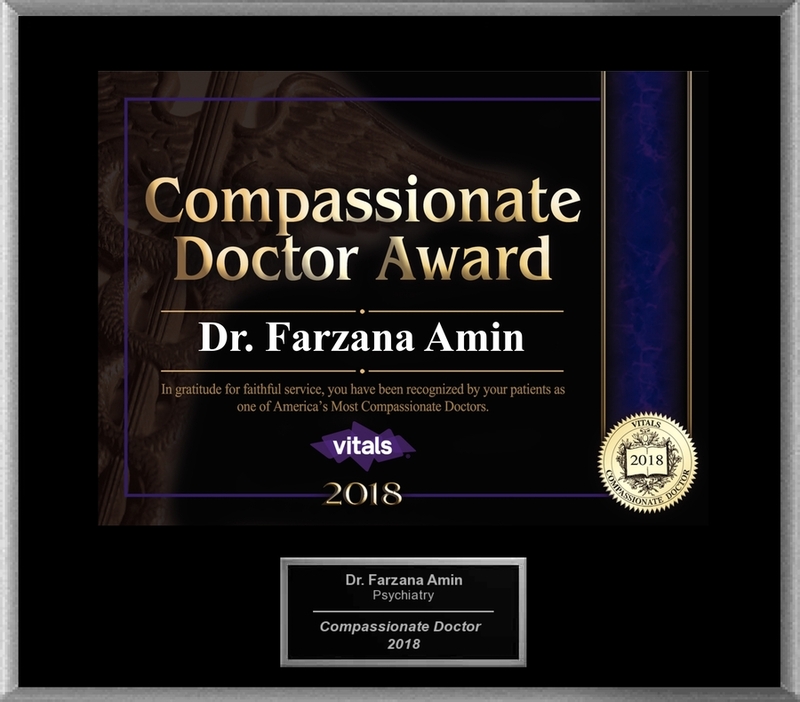 Compassionate Doctor award winners are chosen based on the number of reviews a doctor receives from patients for the calendar year and minimum rating values. The algorithm also takes into account other quality metrics that the provider must meet. With nearly 8 million ratings and reviews, Vitals has the largest collection of crowd-sourced data on doctors than any other online site. Farzana Amin, M.D. completed her residency in Adult Psychiatry at St. Louis Medical University in Missouri, where she served as Assistant Chief Resident from 2005-2006. At Stanford University, Dr. Amin served as a fellow for the Child and Adolescent Psychiatry Program, from which she graduated in 2008. At Stanford she worked extensively with children diagnosed with Developmental Disorders, Autism Spectrum Disorders and Mental Retardation. . She is a double Diplomate of American Board of Psychiatry and Neurology, both for adults and child/adolescent psychiatry.